TV show dates: September 9, 2018 — January 13, 2019. Performers include: Lil Rel Howery, Jessica ‘Jess Hilarious’ Moore, Jordan L. Jones, and Sinbad. 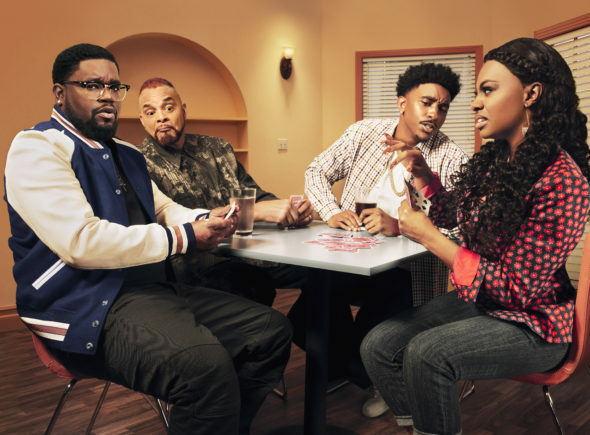 A multi-camera sitcom, the Rel TV show is inspired by the comedy of Lil Rel Howery. Once upon a time, Rel (Howery) was a hardworking, successful husband and father who had everything. His life was going exactly as he’d planned, until he discovered his wife was having an affair — with his barber of all people. As if it wouldn’t be challenging enough to maintain a solid relationship with his children, and find love again, now Rel also has to find someone he trusts to cut his hair. Since his wife took the kids and left him and the West Side of Chicago for Cleveland, Rel has to rebuild his life and find a way to connect as a long-distance dad. On hand to help him are his best friend, Brittany (Moore), and his little brother, Nat (Jones), as well as their father (Sinbad). While Rel can tell Brittany everything, Nat — who has recently completed a prison sentence for dealing drugs (ecstasy, not crack!) — finds it challenging to keep big brother’s secrets to himself. Meanwhile, their widowed father makes no bones about the ways in which Rel and Nat have disappointed him. At the end of the day though, the family is truly central to all of their lives. As he starts over, Rel often falls prey to his own pride. Still, he is optimistic at heart and determined to never give up. Rel takes a trip to Cleveland after hearing his daughter got into some trouble at school. Meanwhile in Chicago, Brittany helps Nat with some goal-setting, by making him create a vision board (courtesy of FOX). First aired: January 13, 2019. What do you think? Do you like the Rel TV series? Should this FOX TV show have been cancelled or renewed for season two on FOX? I really enjoy watching the TV show REL I wish another show such as Meet the Johnsons or Cool Kids was paired up to watch. Please do not cancel this well put together and funny show…..